1983 - 1987 Dutch Lace Education. 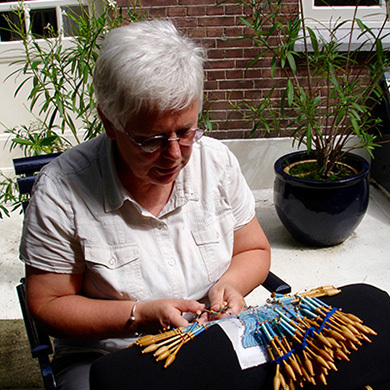 2014, Amsterdam, jubilee-exhibition of the lace group ’t Aemstelkant, several designs. 2013, Amsterdam, participate in Salon/Kant with 3 designs of places in Amsterdam and the Waterfall. 2009 Amsterdam, jubilee-exhibition of the lace group ’t Aemstelkant, several designs. 2007 Annaberg-Buchholz, Bändergeschichte, united work of the lace group “the Lace Attic”, partly my design, 3rd prize united work. 2006 Annaberg-Buchholz, Kontrasten, united work of the lace group “the Lace Attic”, 2nd prijs united work. 1996 Flehite, Amersfoort, “De Vier Jaargetijden”, united work of the lace group ’t Aemstelkant: “Childern playing”, totally my design, honorable mention. 1988 't Aemstelkant, patterns out of the lace group, editorial.